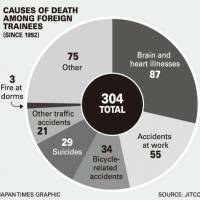 Agencies that dispatch non-Japanese as interns under the government’s foreign trainee program, as well as a government-commissioned foundation that supervises and instructs them, put corporate profits first and are not fulfilling their oversight responsibilities, lawyers familiar with the program say. The program has long been notorious. 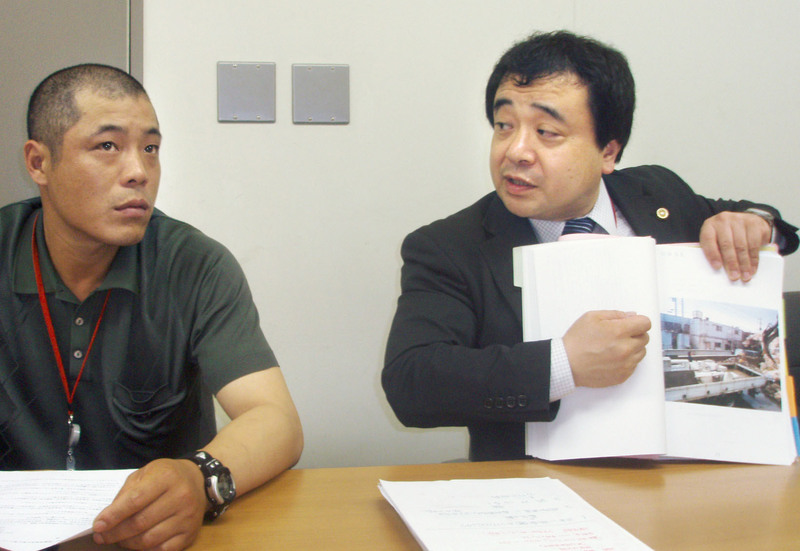 Foreigners, mostly from Asian countries such as China, Vietnam and Indonesia, are “subjected to conditions of forced labor, sometimes through the government’s” industrial training and technical internship program in Japan, the U.S. State Department said in June in its annual Trafficking in Persons Report. 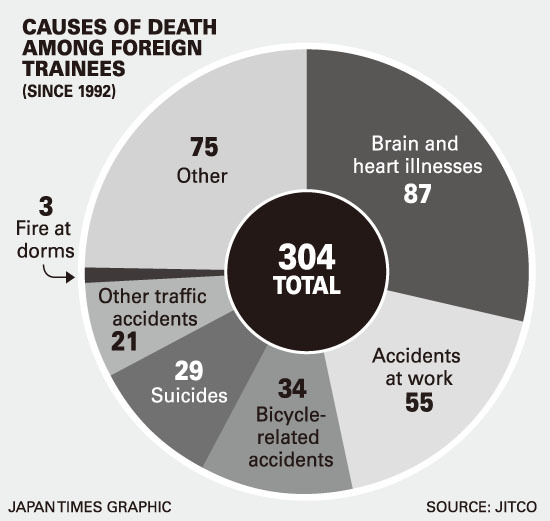 There have been numerous reports of trainees toiling under harsh conditions for miserable wages after coming to Japan with high hopes for a program that was set up to provide them with professional skills over a three-year period. In reality, some workers have suffered sudden death from “brain and heart ailments” while others have committed suicide. Meanwhile, the Abe administration decided earlier this year to expand the program to address the nation’s dwindling labor supply. Small businesses in rural areas are the main employers of the trainees, who are often hosted by commerce and industry groups and small-business associations. China and Vietnam are the major suppliers of trainees. Moro cites the case of a Chinese woman in her 20s who arrived in Japan in late 2010. Her employer, a food processing company in Toyama Prefecture, prohibited interns from meeting anyone outside the company and banned the female interns from getting pregnant. The woman did get pregnant by a man she came to know in Japan. As soon as the company learned she was expecting a child she was ordered to leave the country and forced into a car that took her to Toyama Airport. After she reached the departure gate, she was helped by a Japanese person and was able to get in touch with the man she was seeing. She was eventually able to remain in Japan but had a miscarriage, Moro said. An audit by the Justice Ministry’s Immigration Bureau found that a number of employers force their foreign trainees to work for around ¥300 per hour — less than half the national average minimum wage of ¥764. Some were found not to be paying their interns a single yen. In the program’s roughly 20-year history, dozens of young participants in their 20s and 30s have died or took their own life. “Karoshi is inevitable when they work without rest,” he says. 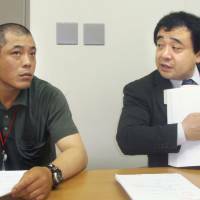 “Their families overseas often don’t know about Japan’s worker compensation system and are pressured by the dispatching organizations in their home countries into not applying” for compensation. Host organizations are supposed to conduct a quarterly audit to see if employers are engaged in illegal acts or human rights violations. But an investigation by the Internal Affairs and Communications Ministry found that these organizations have failed to spot almost every illegal act by the employers. The ministry, which is charged with checking up on the program’s administrative services, said 98 percent of the employers accused by immigration authorities of fraudulent acts, such as withholding pay to trainees, went unnoticed in audits by the hosting organizations. Commissioned by the central government, JITCO is supposed to regularly supervise and advise employers and hosting organizations, but it’s clearly not doing its job. Of those entities blacklisted by the immigration authorities for illicit acts, about 30 percent had not been visited by JITCO officials in the preceding three years. The internal affairs ministry is concerned by the fact that JITCO is receiving fees from the businesses and organizations it is supposed to supervise, and has recommended the Health, Labor and Welfare Ministry take steps to improve the organization’s oversight. Lawyer Moro says that “small businesses in local areas see interns only as a low-cost source of labor. Some host organizations are so bad that they even offer advice on loopholes” to work the system. Lawyer Ibuski wants to see the trainee program to be abolished. “We can’t expect JITCO to exercise oversight functions because it probably doesn’t want to lay a finger on” the participating businesses and organizations, he said.